Jonny Gould's Soccermongery: The Professor IS the beating heart of Arsenal's Beautiful Game. The Professor IS the beating heart of Arsenal's Beautiful Game. If proof were needed of a manager's profound influence on his players, the leak of Arsene Wenger's team meeting notes to the Daily Mail confirms the genius of a man, who's done as much for Arsenal as anyone has done for any club anywhere. Ever. To gauge just how much The Professor's changed The Gunners, recall how rival fans taunted them with boring boring Arsenal - a chant now employed ironically by the home fans each time their team's won a game by halftime. Never has an old song been consigned more soundly to the dustbin than that! Arsenal's Wengerness manifests itself so frequently in lengthy unbeaten runs, two-dozen passes leading to Goal Of The Season and sound thrashings meted out to lesser-prepared teams and their array of transient managers. And it's all down to The Man. But just how does The Professor keep such basic tenets of belief so fresh for his players when the challenge is just to keep winning? The answer to that lies in his constant desire to keep adapting to the conundra set by differing opposition - by succeeding. Players come and go, in the case of Hleb and Flamini, sometimes faster than he wants them to. 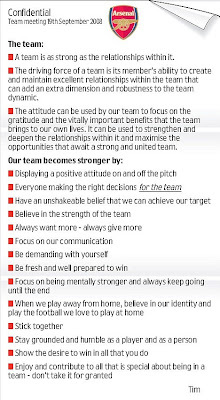 But Wenger's principles remain steadfast in the face of a changing football world - and the ultimate insurance policy against have-a-go billionaires who think they can buy glory. There are many ways to skin a cat. Compare The Professor with Fergie with The Special One and you'll unearth a multitude of routes to a Winning Formula. The greats are often mavericks with seemingly unorthodox methods. From Shankly's “If you're not sure what to do with the ball, just pop it in the net and we'll discuss your options afterwards.” to Cloughie's "When I disagree with a player, we talk about it for 20 minutes and then we decide I was right." But there's a science and logic to Wenger, who's way of management has changed its face forever. His principles on diet, fitness and a team ethic now in the public domain, are universal, for all time and should be adopted by any coach serious about success, now or in the future. I really hope Arsenal win the league this season, not just to propel Wenger to the game's summit again, but also to show the wave of billionaire owners that football's dreams can still be made of Stars - not just Cash Cows. Well, this is all very remarkable coming from an ardent Villa fan. Good on yer, Gould! Up the Arsenal! Never thought the day would come when Jonny would utter the words: ‘I really hope Arsenal win the league this season’!! Good man! I'd really love to see Arsenal win the league too. But the Premier League is such a long, grind and the other three big teams are literally too big and powerful for Wenger FC. It happened last season and it looks like it will happen again this season - where Arsenal's beautiful and brilliant football just gets ground down to third or forth spot. I sometimes think that Wenger should take his ideas to Spain or Italy where the style of play is more ammenable to his football. There is not enough time for me to get into this here but one of my biggest problems with the Premiership is the liberal officiating - and such officiating creates a brand of physical football which is just beyond the laws and the spirit of the game. Wenger is forced to take issue with such officiating every year - and he gets called a whiner and a whinger. It's too bad that the Premier League could not get behind a man like Wenger and take the game in England to a new level. Hell, even Sir Alex has started to change his tune on physical play since he started bringing in more technical players. No. Not against Hull or Sunderland or Fulham. I must say that at this point Arsenal are not very convincing. They do not look at all like trophy contenders. They really do need a hardman in the mid-field and a reliable centreback. Song's lack of steel in the final minutes of the Sunderland match gave Leadbitter a goal he might not have had if Flamini or Viera were in that midfield. I'd like to briefly revisit my criticism of English refereeing and physical football by saying that the City-Liverpool match was a good example of some fine on the ball tackling and great refereeing. The official was spot on in dismissing Zabaletta but didn't over-react to some beautiful, lusty challenges from the likes of Dunne and Richards. Despite my love of Arsenal's free-flowing football, that was a great game to watch.